On the 16th Mike Craig, Don Craig, and Drew Weininger installed new wingtip skids and replaced the points and points cam in the magneto. Mike installed the cam using the alignment marks he thought appropriate (there appeared to be several options marked on the unit). Don adjusted the valve lash on all cylinders and once buttoned back up and prop reinstalled the ship was dragged out into the sunlight for a ground run. But the engine refused to start, and after thoroughly wearing himself out Don proclaimed that the engine wasn't getting any fire. Time to pull the magneto back out and double-check the work. After reviewing what he'd done with the points cam installation, Mike eventually decided to set up the cam from scratch, as if he were building a new unit and ignoring all the existing alignment marks. As the unit came back together Mike realized the points cam had been installed 90 degrees off. With the magneto reinstalled in the airplane the engine started easily and ran great - strong and smooth! Mike, Don & Drew decided to wash the airplane. And then decided to run it again before tucking it away in the hangar till April. Apparently the wash was a "test wash" and the real washing will happen in April! The final tasks on this aircraft are to replace the tires and give it an overall condition inspection. Aside from fluids the guys believe the engine is ready for ground runs. Chris Freeman is coming soon and he will go through the airplane in detail to ensure it is ready to fly. The "Big Day" was the 23rd - the OX-5 was going to be ground run in preparation for flight in April. The airplane was pulled from the hangar and moved to the covered shop pad for final checks, fluids, and engine run. The turtle deck was pulled from the airplane as part of the condition inspection. Dave Orloff pulled out a vacuum cleaner to get the dirt and debris that had accumulated in the rear fuselage. Dave Edgerly and a few other guys started checking the engine and filling it with fluids. Oil was easy, water less so, as immediately there were several significant leaks from the water pump. Fortunately, the carb splash shield kept the carb dry. Fuel was procured, and after lunch the radiator water was topped up and the engine was finally ready to run. Dave Orloff was wearing his lucky "one pull" cap, but it still took several swings before the engine sprung to life. Edgerly was in the cockpit and carefully warmed the old girl up before a couple of full throttle runs. The guys not helping hold the bird performed engine checks, noting that the leaks in the water pump tapered off dramatically and verifying all cylinders were firing. Things were looking pretty darned good! Dave shut the engine down and the valve train was lubed. Steve came over to watch the next engine run and Dave climbed back into the cockpit to run her up again. Dave Orloff took up his station in front of the prop to swing as before, but as he was moving the prop into position a distinct groaning noise was heard coming from the engine. As Dave pulled the prop back and forth we noticed the prop seemed to have a little free play. The engine was checked as best we could to locate the groaning as the prop was slowly moved back and forth. Everyone feared the worst - a bad bearing. The free play in the prop was analyzed and the cause was determined to be faulty installation - the prop had not been fully seated on the crankshaft nose. The key and keyway were inspected for damage and none was found. The Canuck was pulled back over to the hangar and put up and further discussions lead to the notion that the groaning could be from the water pump shaft / seals / bearings as the noise was louder at the rear of the engine and Dave E. said he thought he could hear a faint clicking noise from the water pump. Perhaps that leaking water was a sign? Dave E. and Steve will put together a plan to test out the water pump theory, but it doesn't look like the Canuck will be flying at Air Fair! After a low-altitude power loss, the J-3 was damaged in the ensuing forced landing. Nobody was seriously hurt, but the Cub will be out of action for a while. The 16th was given over to removing a few engine components, pickling the engine for storage, then storing the airplane. The wings were placed on the wall, while the fuselage remained on a dolly on the shop floor. 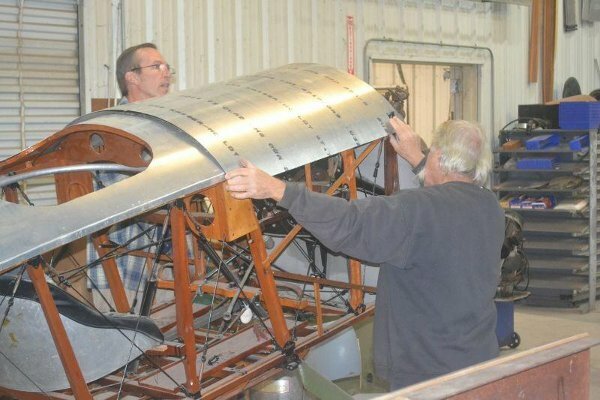 The engine was then removed so Steve could take it back to Memphis for inspection, and the fuselage was hoisted into the rafters to await repairs. Jerry Stark and Steve Richardson continued fitting the tail skid fairing on T-2. They eventually moved on to starting to fabricate the upper fuselage metal fairing that sits between the cockpit fairing and the engine cowl. During the workday on the 23rd Jerry and Steve continued progressing the big forward fuselage top fairing and made a lot of headway! The basic shape is essentially finished, requiring a little trimming where the sheet metal hangs over the top longerons. Looking at T-1's fairing they will need to fabricate a few more items to finish the fairing but it is coming along very well. This may well be the final fairing needing to be fabricated for T-2, though there may be another belly fairing that needs to be fabbed up. Kevin reports he has been painting lots of parts, and that he has a new kick-start gear assembly en route from Norway! Apparently there is a guy in Norway who makes parts for Excelsior, Pope and Indian Power Plus motorcycles! Lynn installed the fuel cut-off valves in the Blue Racer, so the vehicle now has an in-line fuel filter and the fuel can be shut off and the line disconnected from the carb to work on the carb. On the 23rd Clint Allred, his son John and Cameron Whitaker worked on the Blue Racer. They replaced the foot pedal shafts and the transmission bands and tweaked quite a few of the racer's components and at the end of the day had the racer up and running! Clint's wife Cathie came along and provided lunch for the family - they even fed Cameron! On the 16th, John Busch, son Johnny and others charged up batteries and drove several of the vehicles around. On the 20th, the main focus of attention was the Blue Racer but Al Sumrall reports that they also took delivery of some parts that will get the wrecker up and running. Lynn Howell (and Killer) came out but Lynn had to leave early. While he was there Lynn and Al measured all the vehicles to help Terry draw up the plans for the new "garage". Terry needed the dimensions of all vehicles to lay out the proposed building. Ian Whitaker spent part of his day cleaning out the carb on the "liaison motorcycle" as well as assisting his brother Cameron with the T. Speaking of Cameron, towards the end of the workday the transmission on his Model T broke and he stayed up all night and much of Sunday as well repairing it. 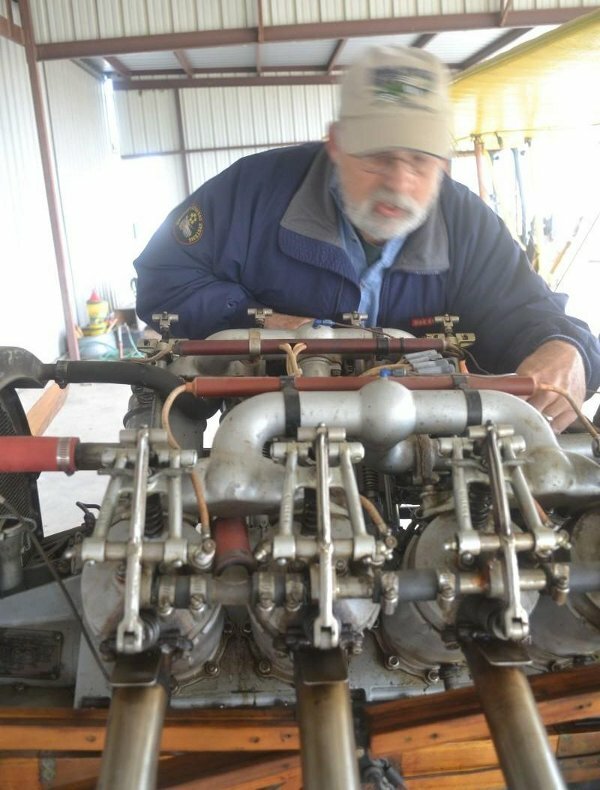 Mikey Orloff stopped by on the 16th to donate a Lawrence aircraft engine and some Curtiss Jenny tail feathers (uncovered). Earl Shea dropped by on Saturday, March 23rd to donate some books, magazines and signed artwork / photographs that belonged to George Holmes - a museum member who passed away some nine years ago. Earl has recently started disposing of George's library on behalf of George's wife. Linda Zakrzewski has donated another 5 boxes of books and materials from her late husband Al's collection to the PFM library. In 2012 she and her boys donated some 40 boxes of books & prints along with Al's unbuilt WWI aircraft model collection. The boxes of books donated this month were apparently recently found in the house! On the 16th Tom Moore continued his work with the rolling stands for the engines typically displayed at our events. The motor he was working on was one mounted on a floor dolly - an inconvenient height to view the engine! Tom was making measurements to construct a taller rolling mount. Stephanie Miller came out to inventory the T-shirts for the upcoming Spring Air Fair. Dave Miller and Tom Miller spent some time out at the pavilion working out a better way to seat folks and speed up the serving lines. Carl reports that he has finished building the wood work and trim on the upper part of the sign, and painted the back side with wood primer. He hopes to finish off his weekend by painting the front side. Despite the progress, Carl doubts the project will be finished by the Air Fair event. He has also asked us to add repair / renovation of the current sign's posts and roof to our project list! On the 16th Al Sumrall, Kurt Maurer and Jerry Stark spent some time on the LMG 08/15 project. Jerry tested out the tooling he developed to bend new top straps which seemed to work fairly well. 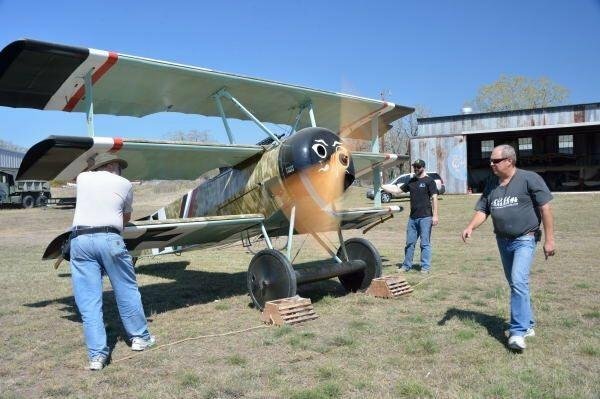 Kurt and Al spent some time talking about the ground gun replicas each has while looking at parts for the aviation replicas for the Triplane and D.VII. On the 23rd the Gun Crew continued working on the ground guns while continuing to advance the aviation gun replicas. Al's cousin, Brent, had made an aluminum trigger guard grip mount component from plans that Al had so Kurt fabbed up a wooden grip to attach to it. Looked very good bolted onto the receiver. Kurt says he needs to do some work to stain it the proper color and all the ribbing / checkering to finish the piece. Jerry returned with the Mk.II version of his jig for bending up receiver top strap parts and it sure looks like it'll do the trick. Tom Gaylord has ordered some 3003 H-14 spec aluminum plate to be cut into strips to test bend several examples to fully proof the jig. Al, Kurt, Tom and Jerry have recently been e-mailing regarding fabricating some two-hole replica ammo belts for the D.VII and the Triplane. These two airplanes are currently equipped with three-hole ammo belts (i.e., belts with three grommets in each round / bullet separator holding the assembly together) which were intended for infantry use. The airplanes used a narrower two-hole belt - something made possible by the feed chutes. You've no idea how this has chafed and gnawed at Al all these years! Al has found two vendors able to provide the appropriate 30mm wide fabric belt material and Kurt did some local research and found a vendor willing to cut brass separators for us, and of course, Vintage Manufacturing can cut steel versions. Kurt also drew up the plans for the laser cutting and had Charlotte and the crew produce a small run of steel separators for experimentation. Kurt also visited with Mike Hallmark - the guy who did the leather covers on the motorcycle seats - to obtain a sample of grommets. The grommets were way too big though. Some work was done to verify material thicknesses and sizes. Doug Ratchford agreed to research the grommets / rivets that hold the belts together. 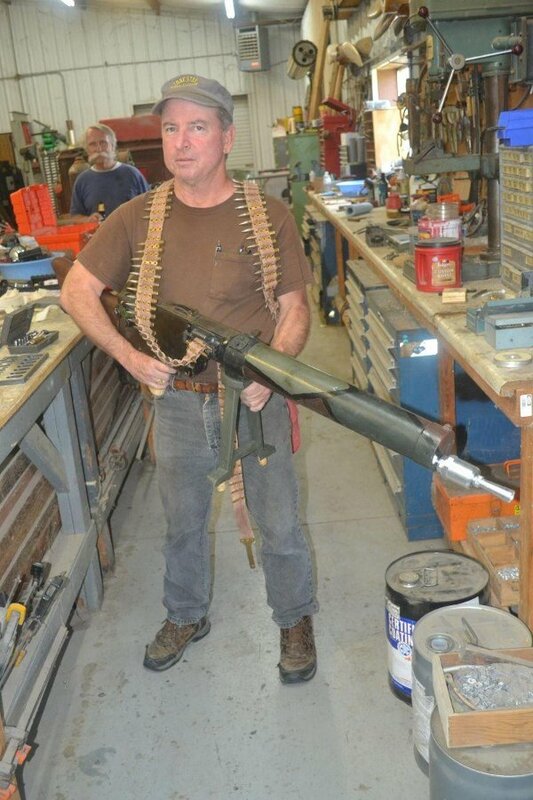 By the next workday Al should have his next type of ammo belt cloth available and we can perhaps get some grommets ordered that will allow the test assembly of the belts. We received word late February that John van den Eynde passed away late January 2013 - he died suddenly from a heart attack. John (and his dogs) spent several winters camped out in his travel trailer on the Old Kingsbury Aerodrome grounds, working on the restoration of the FWD truck, a 2-ton truck used in WWI. John had been making pretty good progress on the cab and the engine. John's history included time in the Belgian military and he was involved with several race car teams before eventually emigrating to Canada.